Empanadas are a favorite snack, and they taste delicious no matter what they look like. But you can't help but aspire to attractive empanadas that don't leak, break, or collapse in the oven during baking. When you first start making them, it seems at least one in every batch explodes in the oven. These tips and techniques that will make your empanada preparation go more smoothly so they look like the perfect ones you see at the bakery. The braided seal of a baked empanada is called the repulgue. A quick search for online videos will turn up numerous ones demonstrating how to fold or braid the edges of empanadas. Some of these videos are quite instructive (and entertaining), but also frustrating. These experts' fingers fly as they fold perfect repulgues, making it look so simple, but when you do it yourself, something will often go awry. Be forewarned—making perfect empanadas is a skill that takes much time and practice. The good news is that even ugly empanadas taste good. First, and most important, let the dough and the filling rest overnight in the refrigerator. Everything will work better—the dough will relax and lose its stretchiness and the filling will be chilled and less runny. Second, after you roll out the dough, let it rest on the counter for at least 5 minutes before you cut out the circles of dough. If the dough is relaxed, the dough circles will maintain their shape and will not shrink when you cut them out. Roll the dough out to about 1/4 inch thickness (about like a sugar cookie) for smaller empanadas, and a little bit thicker for bigger empanadas that are going to hold more filling. It's easiest to start with a nice perfect circle of dough before you fill them and seal them. Although you do want plump, well-stuffed empanadas, it's important not to overfill them. You'll end up with filling that leaks out when baked in the oven, making a mess. (Those empanadas still taste good, however, so no need to throw them out or anything). Place a proportional amount of filling in the center of the dough circle, making sure you have a clean margin of dough all the way around. Try not to spill the filling onto the edges of the dough. The fat in the filling will make the edges of the dough greasy and they won't be able to seal together well. Some people like to hold the circle of dough in the palm of the hand and fill the empanadas while cradling them. That can help you judge the proper amount of filling because the empanada dough will fold around the filling and you can see exactly how much it can hold. But it's harder to keep the filling from touching the edges of the dough (and ruining the seal) with that method. This is an easy but important step. Dip your finger in a bowl of water and run your finger along the entire edge of the circle of dough, lightly dampening it. Fold the empanada in half, enclosing the filling, and press the edges together firmly all the way around, lengthening and thinning them slightly as you press them together. Take the time to perform this step carefully, as it will prevent the filling from finding ways to leak out in the oven during baking. There is an easy way to crimp the edge of an empanada just by using the tines of a fork. 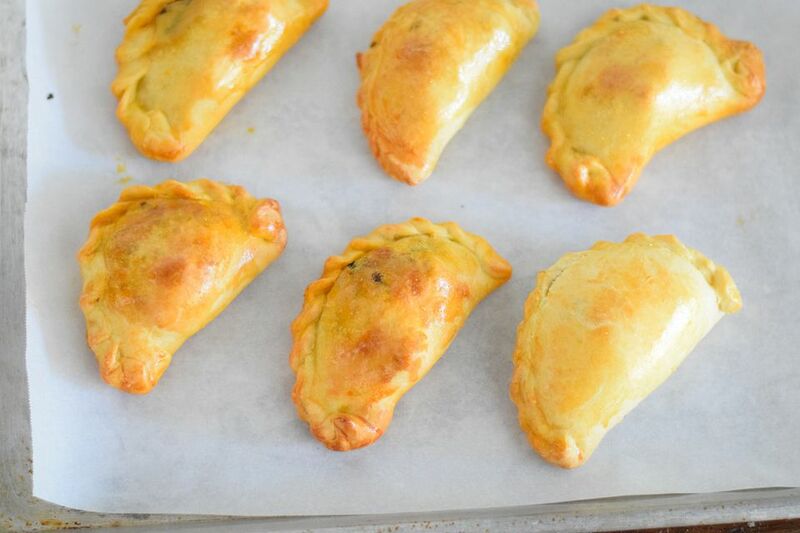 This can be a good method for appetizer-size fried empanadas. In fact, a fork-crimped edge is so common on fried empanadas that when you see an empanada like that, you can almost assume it's fried. The traditional braided edge, or repulgue, is more common on baked empanadas. The type of braid and shape of the empanada can let you know what's inside if you know the code of your particular neighborhood bakery. Bolivian-style empanadas, called salteñas, are braided along the top, rather than the side. If you see an empanada braided along the top, be aware that it might have a very runny filling. Salteñas are famous for their liquidy fillings, which is good to know before you take a bite and it all runs down your arm. To fold the repulgue, think of triangles. Start at one corner of the empanada, and fold a triangle of dough from the seal edge down over itself. Press down to seal it, extended that part of the dough a bit as your press on it, and fold down a second triangle right next to the first. Press it down to seal and repeat, continuing all the way around the edge. The last triangle can be tucked underneath the edge if necessary. Some people like to pinch and fold the triangles between the thumb and first finger of one hand while cradling the empanada in their other hand. Place the sealed empanadas on a baking sheet and brush them generously with an egg wash (egg yolk mixed with a little bit of water). Be sure to coat all exposed parts of the empanadas with an even coat of the egg wash.
Place the empanadas in a preheated 375 F oven. Bake them until they are puffed and golden brown. Empanadas can be eaten warm or at room temperature. You can freeze them to enjoy later. If you freeze them, reheat them in the oven on low heat. You can reheat them in the microwave, but the crust will be less flaky.